Berrier Bed and Breakfasts. Compare latest rates and Live availability for all your favourite places and places you have always wanted to go using our new My Shortlist feature. Click + to add to your Shortlist. Bed and Breakfasts in Berrier, Cumbria for 1 night from Sat Apr 20, 2019 to Sun Apr 21, 2019 within 10 miles, in an Average Nightly price range of £1 to £200. If you re looking for that ideal escape with a touch of luxury then Stafford House is the perfect place to be. An enchanting Grade II listed Folly set in the magnificent grounds of Greystoke Castle. Traditionally furnished to a high standard it still retains the original oak beams bags of character and comfortable charm. br / br / br / br / Only 10 minutes from the M6 Motorway we are perfectly situated for you to enjoy the beautiful Lake District. It is ideal for walkers cyclists and motorcyclists and especially for those who would just like to relax enjoy the peace and tranquillity soak up the beautiful surroundings and let themselves totally unwind br / br / br / br / A warm and friendly welcome awaits all of our guests and in the morning to set you up for the rest of the day a full and hearty English style breakfast made from excellent local produce br / br / br / br / We have two Double Bedrooms one of which is en-suite the second Double Bedroom shares a bathroom/shower room with the Twin Room. All of our Bedrooms have Freeview Television/DVD Hospitality Tray with various drinks and biscuits a plate of fresh fruit Mini Fridge Luxurious Robes Hairdryer and a Rotating Fan. br / br / br / br / The lounge is on the second floor and is one where you just can t help but relax sit back and watch the large satellite television or listen to CD s or the radio. We are also able to offer WiFi just in case you have something on your laptop that just won t wait. br / br / br / br / We will do our very best to help make your stay here at Stafford House as enjoyable as possible and if this is your first visit to The Lake District I can almost guarantee that it won t be your last. br / br / br / br / If you have any specific requirements for your stay (dietary or otherwise) then please feel free to contact us as we will be more than happy to cater for your individual needs br / br / br / br / Greystoke is a quite a large village but very friendly with it. We have a shop / post office a very good pub called The Boot & Shoe which serves excellent food and drink. Lane Head Farm is a family run bed and breakfast providing 7 en-suite rooms, free WiFi, car parking, bike storage (located on C2C route). Superbly located for experiencing all that the Lake District has to offer, yet it lies in the quieter North Lakes. A very warm welcome awaits you at Smithy Cottage a luxurious B & B accommodation in the Eden Valley close to the Lake District National Park. Smithy Cottage is ideally located to explore the breathtaking views and the activities that Cumbria has to offer. Easy access to lakes mountains coast and countryside make it an ideal location for a relaxing break. Enjoy a relaxing stay in a traditional sandstone Cumbrian home with modern comforts. Our bedrooms are large and light with underfloor heating flat screen TV with freeserve well-stocked hospitality trays and hairdryers. Our en-suite full bathrooms have power showers and spa baths with underfloor heating heated towel rails fluffy towels and locally produced toiletries. Guests can unwind in the comfortable lounge or conservatory. /p Smithy Cottage is only five minutes from the M6 motorway but is surrounded by beautiful country side. Our property is an excellent base for visiting the lakes mountains and forests of the Lake District. Its location is also ideal as a stopover when traveling into the borders and Scotland. We are close the market town of Penrith which still has many independent shops and within easy distance to Carlisle. The immediate area is rich in history with many historic houses gardens and castles nearby. We welcome walkers and cyclists and can provide tailor made services such as packed lunches drying boots and clothing and locked storage for bikes. /p By prior arrangement we can provide a pick-up / drop-off service from main line railway and bus stations at nearby Penrith or Carlisle and also to and from local restaurants and hostelries. For cyclists doing the Coast 2 Coast cycle route Smithy Cottage is close to the official route being only two miles along a flat road. Our accommodation is ideal for those needing special pampering at the start or end of a challenging days cycling. Albany House is a late Victorian town house,rated 4 Gold stars by the AA.We are just minutes from the M6 and the A66,and only 5 miles from lake Ullswater.Whether on holiday or just passing through you are assured of a very warm welcome. Village in on the village green , serving good food ,real ales and fine wine. On the coast to coast cycle route. 4 Stars non-smoking Bed & Breakfast in Keswick Cumbria English Lake District close to Keswick town centre & historical Castlerigg Stone Circle. Superior en-suite rooms with views. Private Car Park. En-route for public transport. Open all Year Charming! One of few Guest Houses in Keswick with private parking for all guests, quietly situated near town centre & lake. Come away and feel at home, with comfortable, stylish bed & breakfast accommodation in a friendly, relaxed setting. Located in the heart of Keswick with dramatic fells and lakes on the doorstep the Skiddaw Hotel offers a window into the bustling Keswick life. It s easy to see why people choose to relax and unwind here. This warm and hospitable hotel has a welcoming lounge bar and conservatory that overlooks the bustling main street. Upstairs the Latrigg Lounge is ideal for residents a peaceful place from which to observe the town below. With 43 modern bedrooms it is the perfect base for your visit to the Lake District. Dining in 31 The Square restaurant guests can enjoy a personal service and a first class meal created from some of Lakeland s finest ingredients. Why not try our cheese board which features our very own soft Damson cheese from the local Thornby Moor Dairy. The Greta Suite provides the perfect venue for a variety of special events whether a beautiful wedding anniversary birthday bash or funeral tea. It is also popular venue for meetings conferences and exhibitions. Features The Skiddaw Hotel offers 43 modern bedrooms with flat screen TV s and tea and coffee making facilities. Furnished to a very high standard the hotel offers a variety of rooms to suit all tastes large family suites plus the addition of the cosy self-catering Cottage Suite adjacent to the hotel. There is free Wi-Fi and parking is available for �2.00 per day. Surrounded by the picturesque lakes and mountains of the Lake District Skiddaw Hotel is a short walk from Derwentwater and many other famous walks and locations in the area are easy to reach. Dining A full Cumbrian or continental breakfast is the perfect way to start the day made using locally sourced ingredients and can be served in the main restaurant or conservatory. The 31 The Square restaurant serves menus featuring local produce and is renowned for first class service and cuisine. Guests can enjoy their meals in the spacious air-conditioned restaurant that perfectly complements the stylish accommodation. All dishes are freshly prepared by the head chef using the finest ingredients to give that special flair and individual appeal. Popular with locals and guests alike the lounge bar serves refreshments on a daily basis including full afternoon tea and the modern conservatory is the perfect place to enjoy the sights and sounds of the market square. The traditional George Hotel stands in the very centre of the bustling market town of Penrith on the edge of the Lake District and the North Pennines. Free parking is available and free high-speed Fibreoptic Wi-Fi can be accessed throughout the property. Meals can be enjoyed in the intimate, candlelit 2 AA Rosette Devonshire restaurant which features a beautiful ornate ceiling and an open fire. An all day bar is also available for guests to use. Enter through the George Hotel's revolving doors and experience quality and tradition to remind you of bygone days. The nostalgic wood panelling and old local wall prints combine to create a warm and welcoming atmosphere, where many generations of loyal visitors have returned time after time. Make this lovely hotel your own homely base when visiting the Lake District and the North Pennines. Only moments away from the bustling market town of Keswick this elegant Victorian hotel stands proudly in 4 acres of tended gardens and walkways and enjoys views of the Latrigg and Skiddaw mountains. 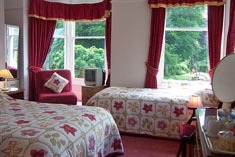 The Keswick Country House Hotel prides itself of professional yet friendly service. Dining in our beautiful Lonsdale restaurant is truly a memorable experience. Our talented chefs delight in preparing daily menus with the emphasis on flavoursome dishes using local produce when possible. Comfortable yet stylish accommodation is available in a selection of room types with our lounge bar available for pre-dinner drinks we aim to make your stay in the English Lake District a memorable one! Limes Country Guest House is located in a rural location, 2.3 km from the town centre of Penrith, on the edge of the Lake District National Park. All rooms are equipped with a flat-screen TV. Certain rooms include a seating area where you can relax. Some rooms feature views of the river or garden. Limes Country Guest House is 6.2 km from Ullswater Lake, while Pooley Bridge is 7.1 km away. Whinfell Forest is 9.9 km from the property. Keswick is 25.6 km away. The nearest airport is Newcastle International Airport, 81 km from the property. Crosby provides lovely Bed & Breakfast accommodation in Penrith Cumbria. Penrith is a lovely market town perfectly located for touring the beautiful Lake District Eden Valley and Hadrian s Wall. The Scottish Border is only 20 miles north on the M6 making Crosby an ideal Penrith accommodation stop when travelling to and from Scotland. Crosby offers Penrith accommodation just 5 minutes drive from the M6 motorway and the A66 and is a Victorian town house located in a quiet part of town now designated as a conservation area yet only 5 minutes from Penrith town centre and numerous lovely shops and eating places. Ullswater is only 5 miles drive from Penrith. Gordon and Jocelyn would like to welcome you to Acorn Guest House a family run 200 year old former coach house situated in the historic market town of Penrith - the Gateway to the Lakes. br / br / br / br / Having re-opened in July 2004 after undergoing extensive refurbishment from it s previous existence as The Townhead Hotel and now under new ownership as of June 2017 our aim is to offer all of our guests a relaxing and enjoyable stay in a family friendly environment. br / br / br / br / Acorn Guest House is the ideal place to base yourself whilst exploring the majestic countryside and the many attractions that the Lake District Eden Valley Pennines & Yorkshire Dales have to offer. br / br / br / br / Situated just off the A6 on the edge of Penrith the guest house is just a 5 - 10 minute stroll from the centre of town where you will find all your essentials and many local delights thrown in as well. br / br / br / br / We offer seven en-suite guest bedrooms each with their own individual quirk with either front or rear facing views of the surrounding countryside including 2 Twin rooms 2 Double rooms a King room a Triple room and Family room. br / br / br / br / We also offer a guest lounge fully licenced bar and plenty of storage for those cyclists amongst you - Acorn Guest House has something to offer for everyone! br / br / br / br / Breakfast is served daily from 8.00 and offers a wide selection of locally produced food to ensure you get your days off to the best possible start. br / br / br / br / For those feeling adventurous or up for a challenge then we are perfectly located for the many cycle routes which come through Penrith including the Coast to Coast (C2C) cycle route with the route itself located only 5 yards from our front door. With ample secure bike storage available along with bike washing facilities and a drying room for those rainy days - the Acorn offers all the facilities any cyclist would require. br / br / br / br / Parking is available onsite at the front and rear of the property free of charge with additional parking in the surrounding areas. A warm welcome to Tynedale Guesthouse which is ideally situated a couple of minutes walk from Penrith town centre with its numerous individual shops restaurants and bars. br / br / br / br / Thomas and Marguerite offer a warm clean and comfortable stay to all of our guests in their Victorian townhouse home which is only a few minutes drive from Junction 40 M6 and also the East West route A66. br / br / br / br / Whether you are working or on holiday or just having the odd night away our delicious locally sourced full English breakfast will set you up proudly for the day ahead. br / br / br / br / Close to our beautiful Lake District Lake Ullswater 5 miles Eden Valley Pennines and Yorkshire Dales also Scottish Borders Tynedale Guesthouse is where to stay. Welcome to White House... This Country Guest House is situated just 2 miles from the market town of Penrith and Junction 40 of the M6/A66. br / br / br / br / The White House Guest House offers four star accommodation and is ideal for families couples and children. Whether on business or pleasure we offer guests comfortable accommodation for visiting the Lake District or a stopover on your journey. br / br / br / br / Comfort and cleanliness are our priority along with a relaxed atmosphere. br / br / br / br / In the dining room a delicious breakfast is served using local produce (special dietary requirements are accommodated by prior arrangement). br / br / br / br / The White House applies a strict no smoking policy throughout the house. The Lodge has been fitted out in a modern contemporary style. All bedrooms are fully en suite with internet access direct dial telephones and flat screen satellite TV. Bedrooms are a mixture of double twin and family to cater for all combinations of groups or individuals. At the heart of the Lodge is the all day coffee shop which serves continental breakfast in the morning coffees and snacks throughout the day and also has a fully licenced bar which serves continental and local beers spirits and a wide variety of wines by the glass and by the bottle. Although The Lodge does not offer full meals - continental breakfast is included in the room rate - The Kings Head Hotel - which is under the same ownership and is a two minute drive from the Lodge - serves all day gastro bar meals and also boasts a fine dining restaurant The St. Johns - which are available to guests staying at the Lodge. Pauline and Mark look forward to welcoming you to Craglands Guest House for b&b in Keswick in the Heart of the English Lake District. All the bedrooms feature uninterrupted mountain views of Grisedale and Causey Pike or Latrigg Fell. Most of Craglands bed & breakfast accommodation in Keswick is en-suite. Lindisfarne House is a Victorian Guest House situated close to Keswick town centre but in a quiet location and central to the lakes parks and theatre. We pride ourselves on our locally sourced produce and cater for special clients. Dale Head Hall in the English Lake District. This hotel offers the ideal starting point for your Lakeland break. This Jewel of the Lake District sits alone on the shores of Thirlmere with superb views of the lake to the front and of Helvellyn to the rear. Truly The Lake District Hotel this is a truly magical and romantic setting where you can wander down through mature gardens to the lake shore. Look at the splendour of the fells across the lake turn around and view the majestic slopes of Helvellyn perhaps the most well known mountain in the English Lake District. This is the place!! In the Lake District National Park, Inn on the Square has a central location by Keswick's market square. This family-run property offers Scandinavian-style design combined with Cumbrian elements. Modern bedrooms have an en suite bathroom. The property features a chic lounge bar and a steakhouse. A 10-minute walk from Derwentwater Lake, the property is close to shops, bars and restaurants. You can take a boat out or simply enjoy a walk and the lovely views. This four star hotel features modern Scandinavian design mixed with a love for all things Cumbrian. Boasting a handy central location on Keswick s main street means that everything is just outside your door from shops to bars restaurants to typical Keswick sweet shops and Derwentwater lake is a 10 minute walk. Offering 34 modern bedrooms a chic lounge bar and AA rosette award-winning Brossen Steakhouse the Inn on the Square is perfect for romantic weekenders fresh-air seeking walkers or people who simply love the Lake District. The Crow Park Hotel is a traditional Lake District Hotel located in the old market town of Keswick Cumbria. This Keswick Hotel offers en-suite bedrooms many having excellent views of the Derwent fells and Skiddaw mountain range making our location ideal for the many Wainwright walks Keswick has to offer. An advantage of staying with us at the Crow Park Hotel Keswick is that a Hotel or B&B with car parking in Keswick is hard to find. br / br / Only a three minute stroll to the Keswick Mountain Rescue Post and adjacent Keswick Theatre by the Lake on the shores of Derwent Water Lake which hosts the popular Keswick Launch and the Keswick National Trust Office. br / br / Grasmere Ambleside & Windermere are a short distance away. The beautiful Grange Borrowdale and Buttermere valleys closer to home. br / br / Travel Honister Pass with its famous Honister Slate Mine spectacular Newlands Pass and renowned Whinlatter Pass with its ever popular Whinlatter Bikes facility making Keswick the adventure capital of the Lake District. br / br / Further afield Hard Knott Pass leading to Eskdale with the old Eskdale steam railway Wasdale and the deepest Lake highest mountain (Scafell) and the smallest church making for a great day out of course taking in Muncaster Castle and Ravenglass with its Roman bath house. br / br / All this of course after a freshly cooked Crow Park breakfast including local Cumberland Sausage made in Threlkeld. The Whitbarrow Hotel is located 6 miles from Ullswater Lake and on the edge of the Lake District. It offers modern studios, a gym, indoor pool, sauna and a restaurant. Each studio at The Whitbarrow Hotel has attractive design with colourful finishes. They open onto a patio, and include a TV, free Wi-Fi and a bathroom. The town of Penrith is 7 miles away and you can find shops here, as well as a market on certain days. The property offers easy access to the Lake District National Park. You can reach the charming village of Grasmere and William's Wordsworth's house, Dove Cottage, in just 35 minutes by car. Nestled in the quaint Cumbrian village of Penruddock, Herdwick Inn is a traditional 18th-century pub with on-site restaurant and accommodation. Guests can enjoy picturesque views over the Northern Fells of the Lake District National Park. Free private parking is available on site. Each room features scenic views over the surrounding countryside, along with an en-suite bath or shower and a TV. Tea/coffee making facilities and a hairdryer are also provided. A full English breakfast is served each morning in the dining area, as well as home-cooked evening meals. A wide range of real ales are served in the bar and during the warmer months guests can relax in the beer garden and patio. Scenic hikes can be taken in the local area, along with many other activities such as boating, mountain biking and horse riding.